In marshes with Acorus calamus, Asclepias incarnata, Calamagrostris canadensis, Carex stricta, Cicuta maculata, Dryopteris thelypteris pubescens, Eupatorium perfoliatum, Onoclea sensibilis, Polygonum coccineum, Sagittaria latifolia, Scirpus pungens, Scirpus validus creber, Sium suave, Sparganium eurycarpum, Typha latifolia. Herbaceous perennial to 3' high from a creeping rhizome. Leaves basal, to 32" long and 1" wide, tapering to a point, parallel-veined, pale green to grayish. Flowering stems stout. Flowers light to deep blue or purple, sepals 3 with a hairy yellow basal spot, more than 8" long; petals 3, narrower, erect, upper surfaces glabrous; styles 3, 2-lobed, the branches auriculate at the base, arching over sepals; stamens 3, obscured by styles. Fruit a 3-chambered, erect capsule. An attractive flowering plant and easily cultivated in wet soil. There are several similar species and varieties that are difficult to separate. 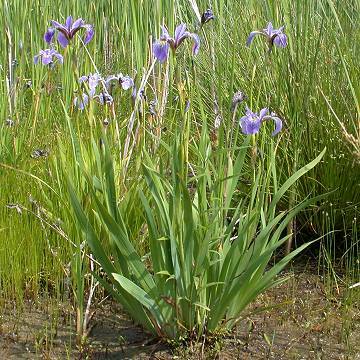 These pictures are of Iris virginica L. var. shrevei (Small) E. Anders. This variety is most common inland and is has darker leaves and flowers than var. virginica of the coastal plain. Another species, Iris versicolor L. looks very much like it except it is said to have stiffer, more upright leaves. In addition the sepal blades are more ovate to reniform, merely papillate (bumpy) at the base rather than hairy, and is unspotted or with a greenish yellow basal spot. The New York Botanical Garden. Bronx, NY. Niering, W. A. 1979. The Audubon society field guide to North American wildflowers: eastern region.